I have many heart to heart conversations with budding and seasoned women daily about living a vibrant life. During these talks, I learn so much about their pains and desires. All of them want healing from past relationships and loss of loved ones; have dreams to become entrepreneurs, advance in their careers, and the list goes on. Moreover, the vast majority even talk about feeling out of balance, difficulty losing those last 8 pounds, aren’t getting enough sleep at night, going through a major life transition, career changes over 50, plus more. Perhaps you find yourself in these same situations at this very moment. Or, maybe you’re not fully clear on how to move from where you are to where you want to be. What’s really holding you back from living the vibrant life? Living your most Vibrant Life is possible when you use winning strategies to feel good, look good, and do good. The ultimate key to living a vibrant life is understanding balance and how to get in touch with yourself. Unfortunately, the vices above keep your happiness, joys, and pleasures at bay. How can you get in touch with “you” with all of this noise? It’s easy to feel like you can barely make it, make ends meet, pay bills, learn the roles in new job positions, embrace love, and be your best self all at the same time. Balancing your time and involvement in relationships, work and helps you become more self aware. Also, balancing centers and leads you into a state of mindfulness. Older women, in particular, are using mindfulness as a means of self-care these days. You become fully present and in the moment because you realize that time spent means more than time wasted on trivial things. You want to feel good, look good and do good because you’re open to new ideas, a fresh perspective and solid philosophies that’ll change your mindset from mediocrity to living vibrantly. When you feel good, you know who you are, what you stand for and what you want out of life. When you look good, you’ll see confidence, vibrancy and empowerment radiate from your skin, show up in the way you dress, and in the conversations you hold. When you feel and look good, you can do good. You perform better for yourself and for others. Dr. Geneva J. Williams is a Master Leadership Strategist & Vibrant Life Architect. She is also the reigning Ms. Black Fit and Fine. For information on her new course, “The Vibrant Life Blueprint,” go here. I’d love to hear from you. Please leave me a comment below and share your thoughts with me. Learn How to Get Your Leadership ON! Download this free audio book and hear 52 tips that’ll give you clarity, confidence and career advice on how to: deal with difficult people, identify your purpose, unplug and leave work at work, stay ahead of the game but not stretch yourself too thin or in too many directions and build a network and support system that will help you achieve your dreams and support your vision for legacy. 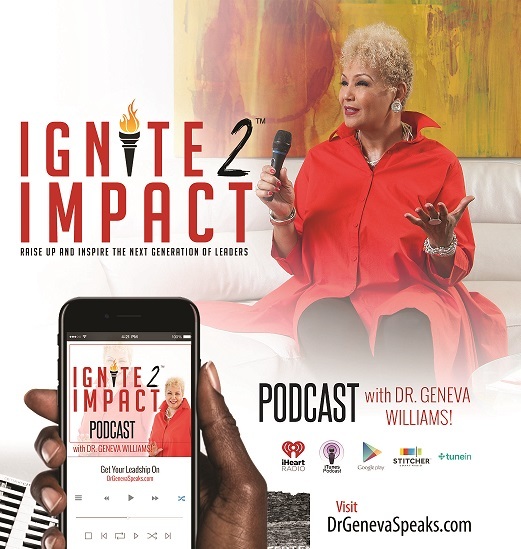 Dr. Geneva J. Williams is a sought-after lecturer, award-winning executive, radio host, and leadership coach. She is known as a high-impact urban collaborator, problem solver, policy leader and community engagement specialist who helps startups to develop and mentor GenXers to succeed in their careers.